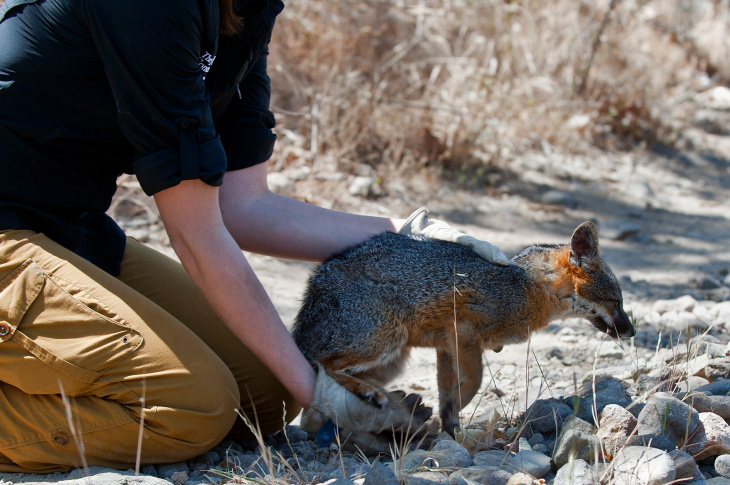 Christie Boser, a biologist with The Nature Conservancy, performs a routine health check on a Santa Cruz Island Fox. In 2004, the fox became an endangered species after the population on the island fell from 1,500 to 15. The 96-square-mile island is one of four in the Channel Islands southeast of Ventura. 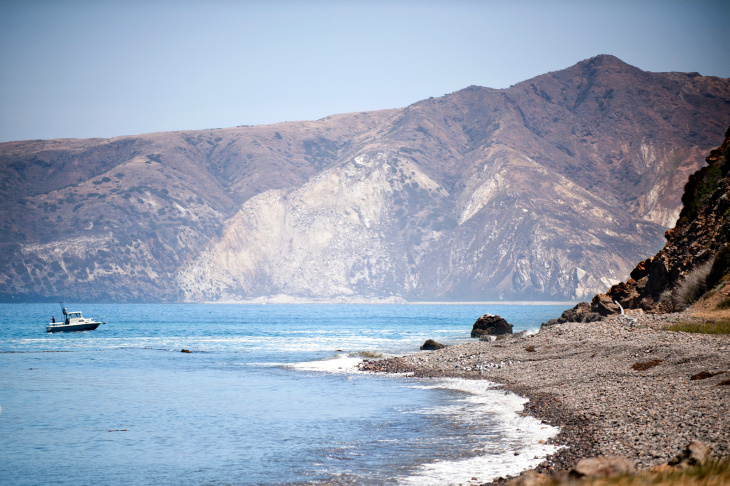 Santa Cruz Island is home to 60 different species unique to the island. 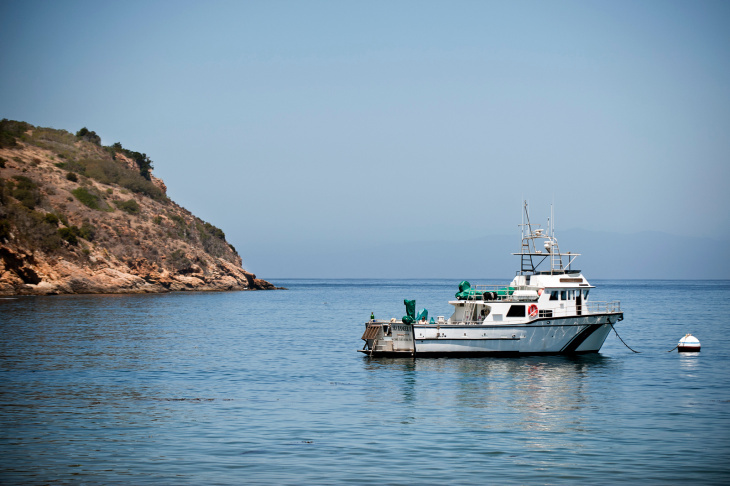 Santa Cruz Island is a 100-minute boat ride from Ventura Harbor. Biologists and other restoration crews live on the island, which was once used by ranchers. Restoration Manager Christie Boser traps the Island Foxes every year for health checks and to mark each fox with a transponder. Since 2006, The Nature Conservancy and National Parks Service have recovered the population almost to what it was. Boser puts a blindfold on the fox to keep him calm during the check. A perfect storm of events caused the Island Fox population to plummet, said National Parks Service biologist Tim Coonan. In the 1850's, ranchers brought pigs from the mainland to the island as a food source. Those pigs eventually escaped captivity and became a food source for the non-native Golden Eagle. The birds began to eat the Island Foxes, too. Christie Boser checks a one-year-old male fox for fleas. 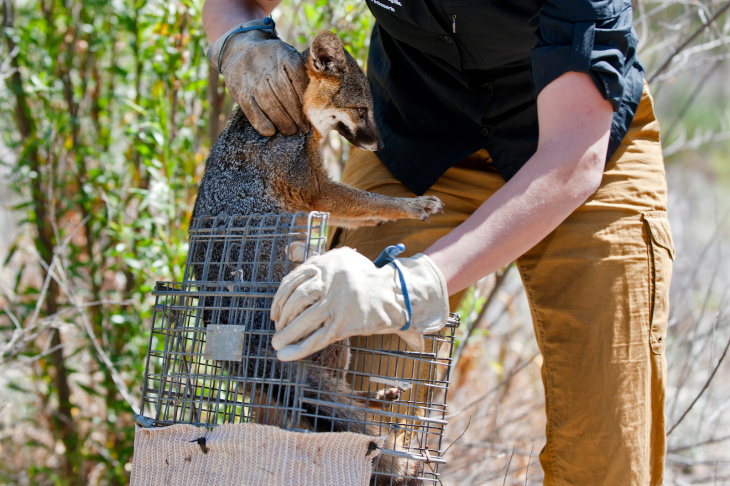 As part of the recovery project, Boser spent a year caring for Island Foxes in captivity and released them onto Santa Cruz Island. 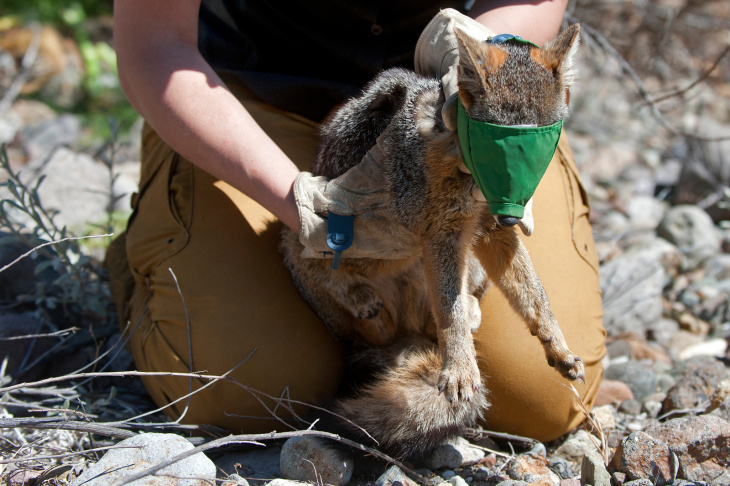 Christie Boser removes the blindfold and prepares to release the Island Fox. Biologist Tim Coonan estimates that the foxes first came to Santa Cruz Island six to ten thousand years ago. He believes that the animals either rafted to the island by an El Niño storm, or native peoples brought them. Now there are six sub-species in the Channel Islands. 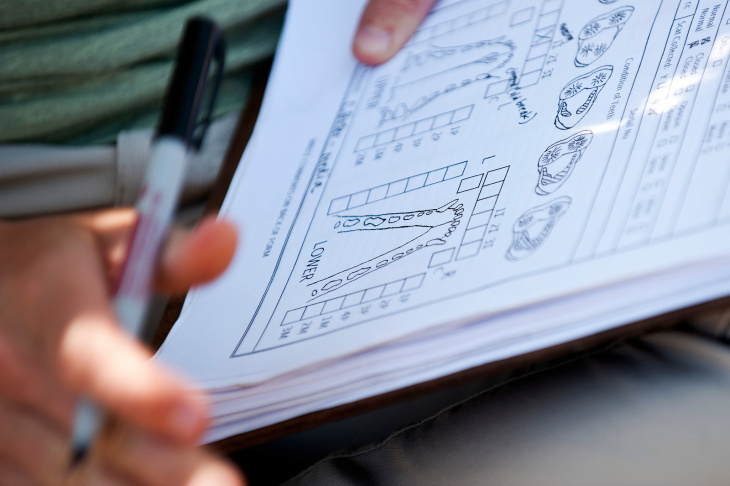 A volunteer for The Nature Conservancy fills out paperwork as each fox is checked. Thirty biologists and other staffers have worked voluntarily on the unofficial Island Fox recovery project in the last ten years. Restoration Manager Christie Boser releases an Island Fox after a health check. After removing the feral pig and Golden Eagle populations, there are more than 1,300 foxes on the Channel Islands. 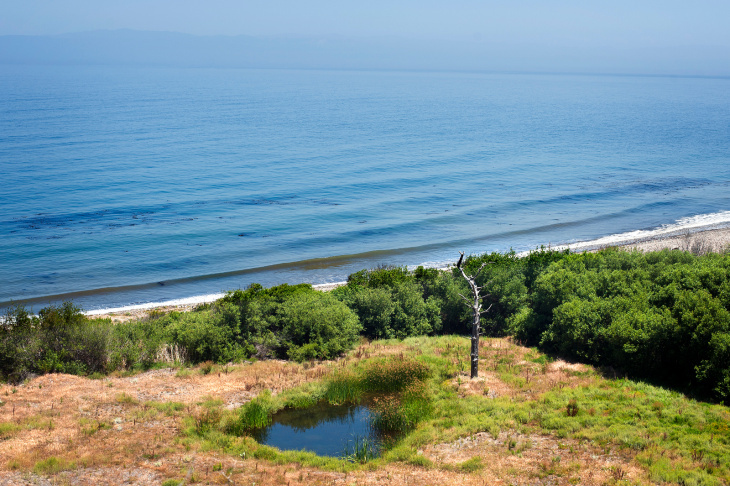 The National Parks Service added two ponds to Santa Cruz Island. The primary worry now for the fox population on the islands is disease. 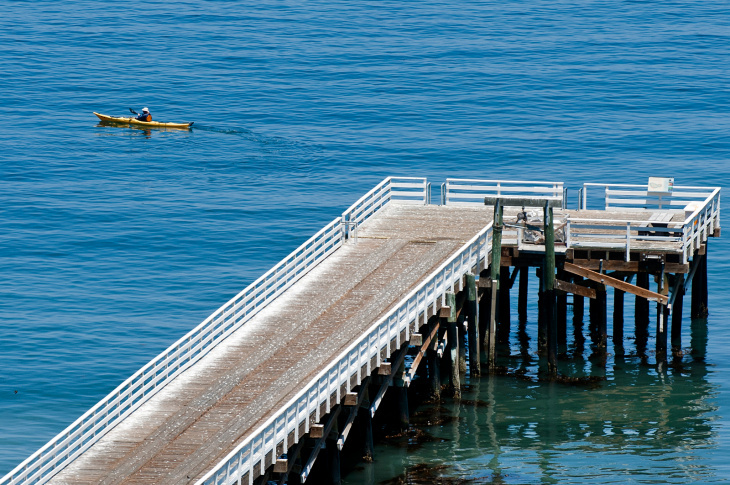 Kayakers pass the dock at Santa Cruz Island. Another project on the island is taking place to remove invasive Eucalyptus trees, which were brought from the mainland by ranchers for shade. A National Parks Service boat transports staffers to and from the Channel Islands and Ventura Harbor. 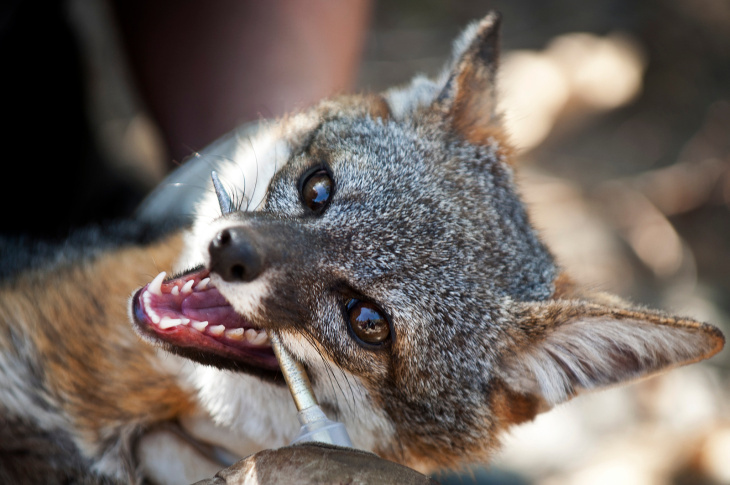 Nestled among California's Channel Islands you'll find Santa Cruz Island, home to pristine chaparral, sea caves and the island fox: a small, fuzzy relative of the gray fox found only on the Channel Islands. But just 15 years ago you'd have a hard time tracking one down — fewer than 100 foxes lived on the island in 2000. 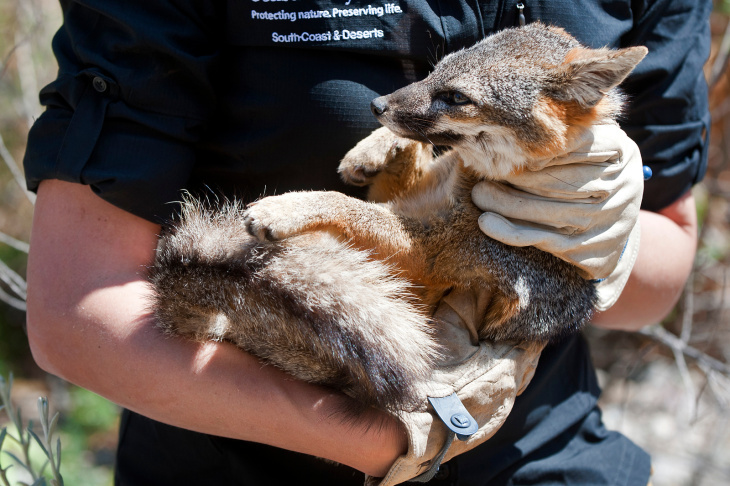 Today there are more than 1,300 foxes roaming Santa Cruz Island. 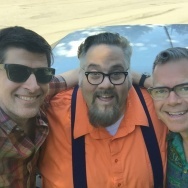 KPCC's Kevin Ferguson reports on the animal’s comeback. 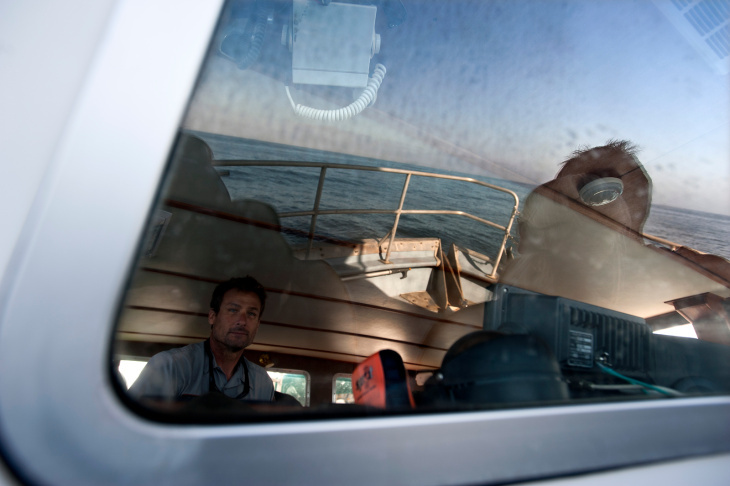 On a Monday morning, a dozen reporters and I boarded a boat headed for Santa Cruz Island. The Nature Conservancy and National Park Service — the island's two landowners — were taking a victory lap celebrating the conservancy's five-year effort to bring back the tiny island fox. The island — just 20 miles off the coast — is the largest of California's Channel Islands, roughly three times the size of Manhattan. Although it's largely uninhabited today, that wasn't always the case. In fact, as recently as 1984, the island was home to several farms and ranches. Today it’s home to a few rangers, researchers and the occasional hiking group. Christie Boser, a biologist for Santa Cruz Island with the Nature Conservancy, is guiding us to demonstrate what's become a routine part of life here on the island: the capturing, monitoring and examination of island foxes. She set out traps the night before. About a half mile inland we find our first fox. 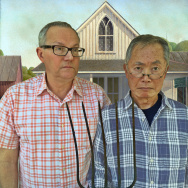 "So I'm holding [him] around the neck. 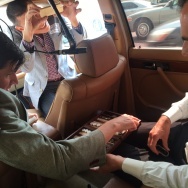 These foxes are pretty docile when they're in hand," said Boser. Boser takes the fox out of the trap; it's a male just about a year old. He's brown, gray and orange, with a bushy tail and a tiny head. Weighing in at about four pounds — he's smaller than my cat. Boser covers the fox's eyes with a blindfold to calm him down. She checks for scratches, weighs him, examines his teeth, combs his fur for fleas. "He has some fleas, which is normal for these guys out here," said Boser. 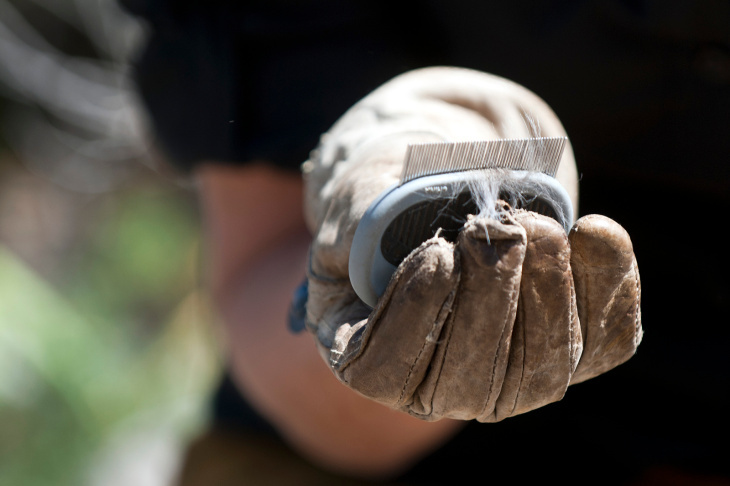 "So far I've only seen one; we give them three little brushes." After a few more tests, she takes the blindfold off, lets go of the fox's neck, and he runs off into the brush to join his 1,300 other fox friends. So what happened to make the island fox go nearly extinct in the first place? "No one suspected that feral pigs on this island could indirectly cause the near extinction of island foxes, but that's exactly what happened," said Tim Coonan, a biologist with the National Park Service. Feral pigs — holdovers from the islands first western settlers — used to run wild. They ruined archaeological sites, displaced the island foxes and, to make matters even worse, golden eagles arrived. "Golden eagles had never bred on the islands before the 1990s," said Coonan. "They arrived out here, and they found prey items that did not exist out here naturally." The giant birds dined on pork and soon developed a taste for fox until the fox population on nearby Santa Rosa Island shrunk to just 15. Fewer than 100 lived on Santa Cruz. That's when the Nature Conservancy and the National Park Service had to take action. Since there was nowhere to go where they couldn't do damage, time was up for the pigs. The two organizations contracted a professional hunting firm in 2005, and helicopters swept across the island with snipers aboard. Traps were set, and crews hunted the feral pigs on foot. The porcine bloodbath lasted until 2008, when the island was officially declared pig-free. The golden eagles, no longer with a food source, moved back to the mainland. Once the island was cleared of the invasive animals, the native fox came back. "So we're standing here 10-12 years after the fox decline started," said Coonan. "They were listed as endangered in 2004, and they're pretty much ready to come off that list of endangered species at this point, which makes it one of the fastest recoveries of an endangered species in the history of the act." The National Parks Service and Nature Conservancy say the island’s transformed completely, and the foxes' coming back is just one part of that. Travis Longcore, an environment professor at USC, agrees. "When I was out there, there were still pigs out there, and you could see these vast areas that were rototilled up by the pigs," said Longcore. "When they say it was a big impact, they're not kidding. It was serious and severe." In the last couple years, maintaining the fox population has been more about keeping an eye than getting involved directly, work like what we saw Christie Boser do. The National Parks Service's Tim Coonan says the biggest threat to the fox today comes in a much, much smaller package. "We fear pathogens, disease like canine distemper virus or rabies. And we have no idea what global climate change to do to island foxes," said Coonan. He says they're dealing with that in a pretty straightforward method for now: If you plan on bringing any other kind of animals to the island, like, say a dog, or a pig … don't.